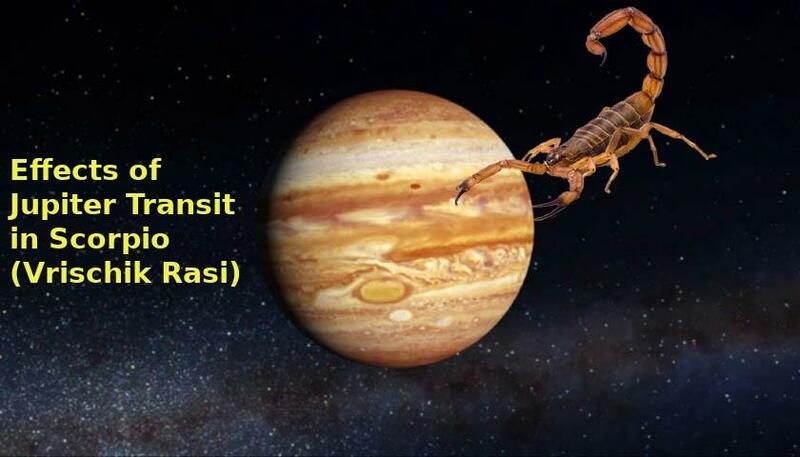 Jupiter, the largest benefic planet which also controls financial businesses, family relations, gold price fluctuations, social justice, sugar and fat in body etc will be entering into Scorpio (Vrischik Rasi) on 11 October 2018 at 06:49 IST according to K.P Ayanamsa. It will remain in Scorpio till 4 November 2019 (06:48 IST) and during these 13 months, it will give positive effects for people born under moon signs and Ascendants of Taurus, Cancer, Scorpio, Scorpio, Capricorn and Pisces. Adverse effects will be seen for those born in Moon Signs and Ascendants of Gemini, Aries, Sagittarius. For other signs, it will deliver mixed results based on transit of Saturn and their respective sign lord(s). New Moon in Virgo (Kanya Rasi) happens 2 nights before Jupiter moves into Scorpio. This is good for Scorpio, Capricorn, Taurus, Cancer born people. Emotions should be kept under control during this month. 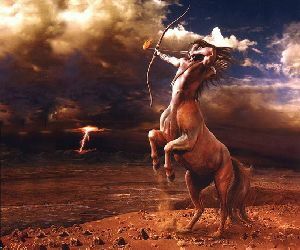 Jupiter in Scorpio seeks revenge for lack of justice or injustice done in past. Jupiter is the planet of expansion, and Scorpio is the sign that deals with sexuality, birth, death, and power. Jupiter in Scorpio reignites a spark something we abandoned long ago. Also, Jupiter in Water sign Scorpio makes us mentally adventurous, less attached to values and more open minded. We will be encouraged to consider what we desire in the depths of our hearts, and are reminded that success is ours if we put everything we have into whatever we pursue. Scorpio’s magnetism and Jupiter’s good luck come together after 12 years. Jupiter in a Water sign teaches us to embrace our emotions, to understand them, go with our feelings, and express them on a social level. Jupiter in Scorpio encourages us to grow and expand emotionally, and because Scorpio is focused and deep, it encourages us to develop intimacy with ourselves and with others. Jupiter can enhance the qualities of a sign it transits and in Scorpio, it will make us obsessive about something we wished for long time. Mars, the owner of Scorpio teaches us a disciplined way to reach our goal. Few people can react violently to attain what they wish for. Communal violence, accidents will be more frequent. Jupiter in Scorpio will not care about politeness, understanding depth of the matter, patience, social reputation. Scorpio is also sign of secrecy. Few people will indulge into occult to acheive their dreams. Energetically, Jupiter and Scorpio are a mismatch. Major difference is that Jupiter looks outside of itself to expand, improve, and grow, while Scorpio’s inner landscape is of particular importance. We should certainly watch for overdoing, overstating, and excessiveness in our relationships. If your body or mind have been experiencing stress over past few years, then next 13 months are the best time to recover. It is time to get rid of old habits and start a healthy life. Do not attempt temporary fixes. Only long term cure will work now. Decisions taken in 2018-19 will create long lasting impacts on your life. Retrograde period of Jupiter in Scorpio, 10 April -11 August 2019, can be testing times for those who are serious in their efforts. Jupiter can expand the negative qualities of a sign, just as it can expand the positive traits. With Jupiter in Scorpio, Middle of the road is no longer attractive to us at this time. We will look and try for long term solutions. Temporary attractions, relations, long lost love found during 2017-18 will slowly end. There will be many attractions, crushes, infatuations and few very of them can happen at soul level. Love marriages will increase. Many, who stayed single for long time, will decide to enter into a long term relation. Jupiter rules legal matters and Scorpio rules revenge. So, we may see justice by all means. If you get an oppurtunity to remain alone and understand your inner call, then use these 13 months to the best. Try not to achieve everything like Relations, money, time, work, justice, love etc by force or deceit. Mars aspecting Jupiter during 06 February – 07 May 2019 and again during 09 August – 25 September 2019 can cause serious unrest, losing patience, violent reactions in general. It is important to have control over urges. Venus conjunct Jupiter in Scorpio during 01-29 January 2019 is not good for single women. Stay away from short term relations and pleasures. Jupiter combust due to close proximity with Sun during 12 November – 10 December 2018 is slow period for people born in moon signs of Taurus, Cancer, Libra, Scorpio, Capricorn and Pisces. Fake babas and gurus will increase their wealth. There will some loss of soldiers in Indian army. Caste and religion based murders will increase (of inter caste or inter religion couples). Indian rupee will not be stable and so will be its economy. Gold prices can increase from late December 2018. Real estate business will slow down but land rates will continue to remain high. Many newly constructed apartments will remain unsold and unoccupied. Indian Public Sector Banks are also struggling. More premature babies will be born. Divorce rate will be more than ever. Pakistan will be cornered and isolated in 2019. USA President Donald Trump to face legal and constitutional issues.